If you'd have asked me before seeing the movie how important the Bernies and the Dr. Malcolm Long were to Watchmen's story, I think I would have answered that they were expendable to some extent. After seeing this movie I realize how wrong I was. Granted, I'm sure the Bernies play a larger role in Snyder's director's cut, but they seemed almost shoehorned into the version we saw in theaters; present only to satiate knowing fans of the graphic novel. The relationship between those two makes their eventual demise that much more meaningful. I didn't find myself caring what happen to these two in the movie, or anyone in New York for that matter. Dr. Malcolm Long's story is vital to being able to fully understand the extent of Walter Kovacs' delusions. In the movie he's reduced to a bit player, and once again, I didn't really care what happened to him in the end. The fact that one of my biggest problems with this movie were the lack of these characters' full stories goes to show just how important they ultimately are. I won't add to the unkind words that have already been written about Malin Akerman's performance as Silk Spectre II, suffice to say she was obviously miscast. I actually didn't mind Matthew Goode as Veidt; the guy did the best he could with what was given to him. The character of Veidt was seriously mishandled in the film; I never really felt like he was a real presence until the third act. It was almost as if he was being hidden for the better part of the movie, perhaps out of that fear that the average movie goer might quickly figure out that he's up to no good. Billy Crudup as the voice of Dr. Manhattan was good at times, particularly the Mars flashback sequence, but at other times I felt like he wasn't nearly enough of a vocal presence. Jackie Earle Haley steals the show as Rorschach, but I feel like Snyder copped out on telling his entire backstory. The movie never shows the origin of his mask, which is a pretty integral plot point. I would hope that the extended edition fills this gap in, but there was no excuse for not putting this information in the movie. Th biggest monstrosity (or lack thereof) committed in this filmic adaptation is without a doubt the ending. I agree that the squid might have been a bit too much, but blaming Dr. Manhattan is not an acceptable substitution. Snyder's version of the ending attempts to placate fans as much as possible while conforming to Hollywood-ending norms. Instead of Rorschach dying alone at the hands of Doc, we get Nite Owl walking in on the proceedings for a Vader-worthy "NOOOOOO!" Instead of Dan and Laurie shacking up while Manhattan berates Veidt, we get Manhattan giving Laurie his blessing and one last kiss before he goes to play God AND Dan attacking Veidt in retaliation for Rorschach's murder. Snyder's version of Watchmen's ending makes Veidt's choice seem rational and in the right; completely missing the ambiguous tone that Alan Moore took in the original. Whereas the graphic novel stressed the threat of the unknown, Snyder leans more on the threat of Old Testament wrath. Snyder's ending essentially says: "As long as everyone thinks Doc is watching, no one tries to blow anyone else up". This totally misses the point of the original ending; actually UNITING humanity against something they don't understand so that the thought of hurting one another doesn't even cross their minds. Snyder's ending doesn't unite anyone, it's just another glorified Iron Curtain stand-off. It remains to be seen whether Snyder's director's cut will right some of these wrongs, so I'll reserve my judgment on the film as a whole until I see that version. However, I don't think anything about the film will be drastically different. 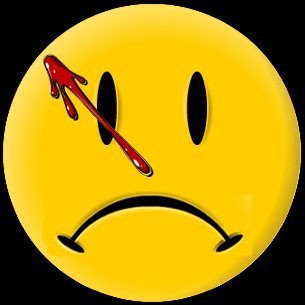 Chalk this one up as a disappointment made even more disappointing by the fact that I think I could have lived with all of Snyder's omissions and changes if he hadn't screwed up what makes Watchmen so great: The End.